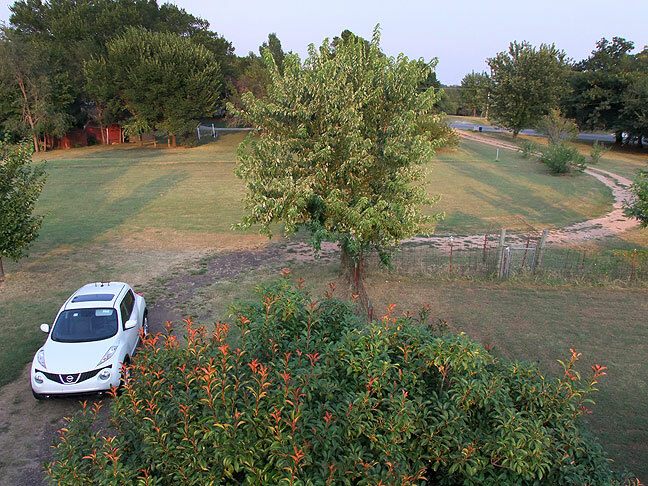 This view from our rooftop looks east, You can see my car in the driveway, which leads 100 yards to the street. An audio tape I made in sixth grade with my friend Keith Berry called Keith Berry’s Top of the Roof Show, which we recorded while on the roof. My friend Scott Andersen, who is afraid of heights. I also checked on my amateur radio antennas, which were in good condition. Finally, noting that I had forgotten what a great view it was, I climbed down and then back up again with a camera to make a couple of images. Looks like the pond is in the receding mode again. The yards look great. Nice mowing. One could almost putt-putt here. Great photo! At first I thought maybe you had gotten a drone. Great overview of the property. Yes, the pond brings back memories of target shooting. I’ve got some more beef jerky we can shoot at. Everything looks so well manicured, great job! I’m often amazed at how just a *little* height puts a completely different perspective on things. Just one story up sometimes makes a huge difference in what a photo can show.